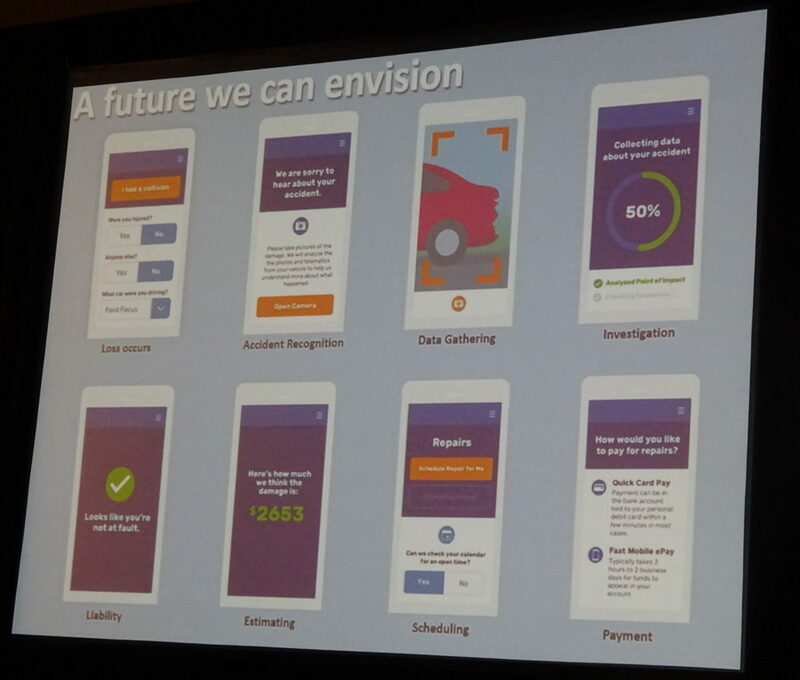 Allstate claims innovation and customer experience Vice President Shawn Broadfield this month described a fairly seamless electronic first notice of loss experience coming “pretty fast,” with elements of the process already in place. Similar to a process articulated and at least partially established by CCC, Broadfield’s presentation outlined a system in which a loss could be detected by telematics and confirmed by a policyholder. The customer is directed to take photos and verbally describe what happened, with their oral account converted to text and examined by the AI along with relevant telematics data and information like the speed limit of the road. After liability is concluded, the AI spits out an estimated cost of repair and offers to schedule work at a body shop. CCC’s system — which is already in-market — does or will soon do most of this, though the company has stressed the importance of a human being checking the estimate prepopulated with obvious parts to be replaced. Asked what portions of a claim were automated today, Broadfield said elements of photo analytics had been, though there was still a touch point with a human being. However, he said the company felt it could automate 25 percent of liability determinations by next year. Asked about marrying telematics to photo estimates, Broadfield said the company would have that capability to assess liability by the end of the year, but he couldn’t give a time frame for when this would be possible for an actual estimate. Though he noted it wasn’t really automation, Broadfield also brought up the topic of Virtual Assist, which allows an adjuster and shop to videoconference. 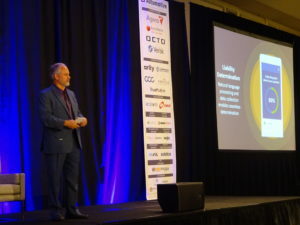 He told the conference the feature was “huge” for Allstate and a “win-win-win” for the shop, insurer and customer given the reduction in time for supplement approval. 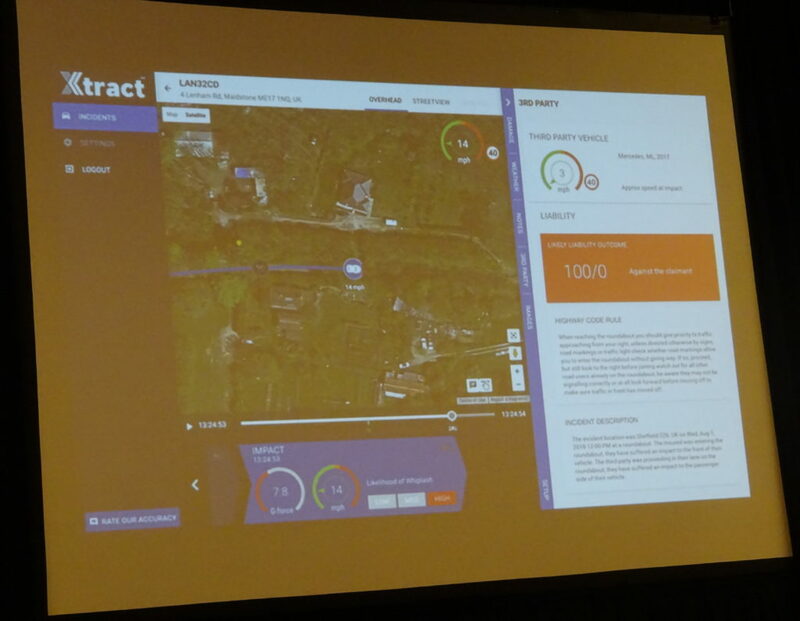 Startup telematics firm Xtract — which has worked with Audatex parent Solera on AI total loss prediction — also discussed how it could use telematics to work out the facts of the loss and immediately predict liability. 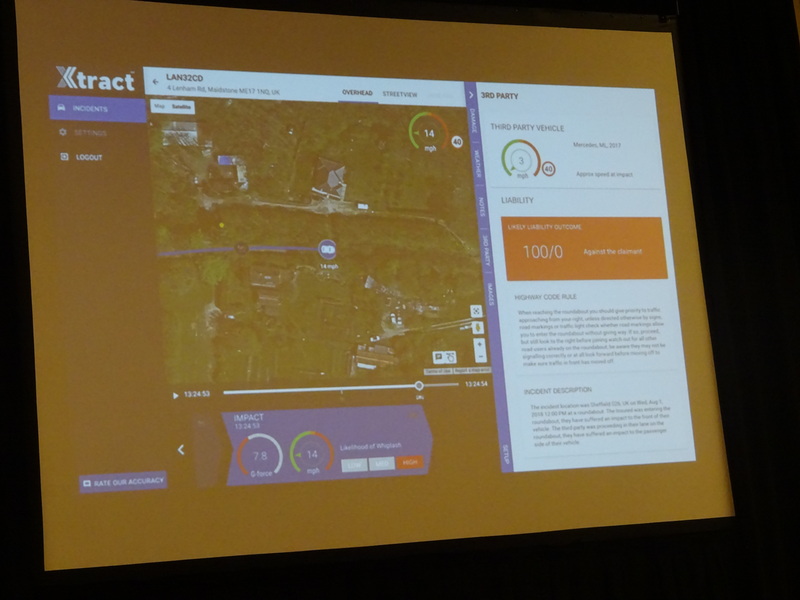 The London-based company, which won the conference’s startup competition, demonstrated how it could collect data from the vehicles and crash — as well as conditions like weather and speed limit — and provide it in a reader-friendly fashion to insurers. (This included an interactive, playable representation of the collision itself.) CEO Michael Flanagan described a scenario where what to a human might look like a 50-50 liability split was actually deduced to be completely the fault of one of the drivers. Asked by a contest judge how the company overcame GPS’ inaccuracy, Flanagan said the company developed its software to snap the vehicles to the road and manually move it to the correct path. Testing had validated the accuracy of the company’s adjustment methodology, he said. He also described the ability to deduce total losses from telematics and immediately ship the vehicle to a salvage yard instead of a body shop, calling it a savings of between about $398-$663 per claim. 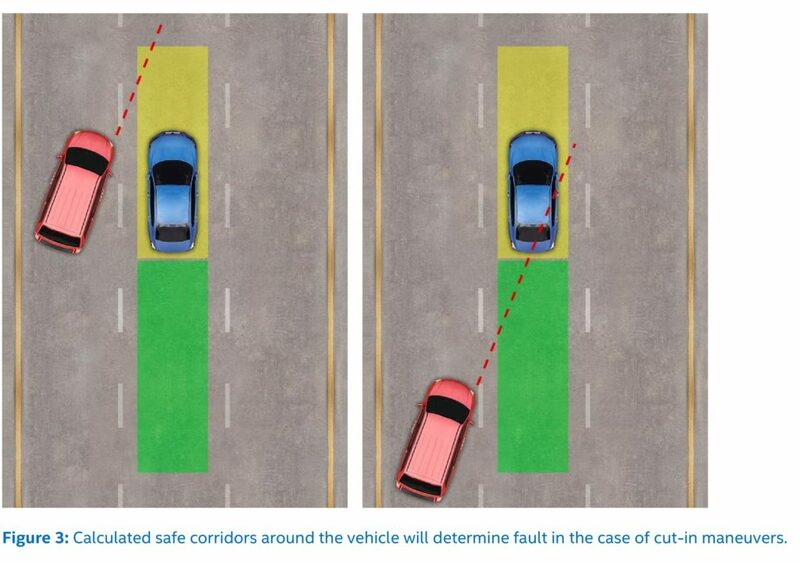 While we’re on the subject of AI determining crash liability, we thought we’d mention a fascinating 2017 paper from Intel subsidiary Mobileye suggesting a method for deducing who’s at fault when a human-driven and self-driving car crash. It relies upon sensor fusion of a high-definition map, camera and radar and lidar to determine precisely how fast everybody was going and the distance between vehicles. The AI just has to work out the values using relatively simple physics and math. The summary paper gives the example of a front car braking and the rear car hitting it. 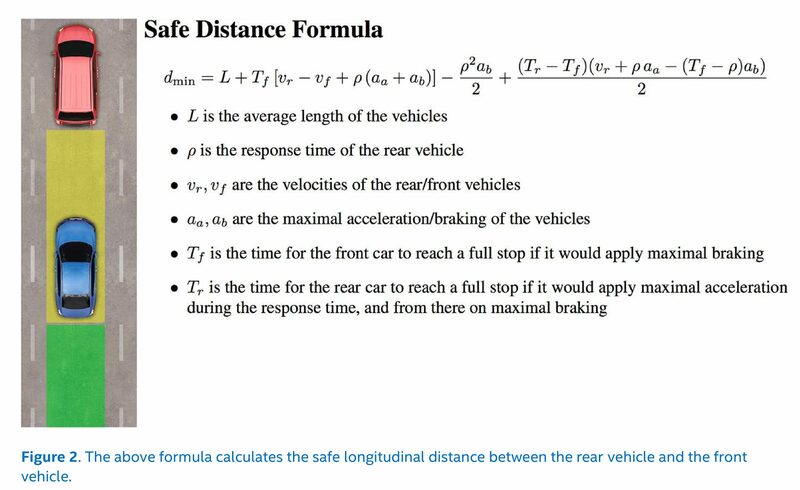 Thanks to some equations and the sensor data, you can actually work out the math on how it’s always the rear car’s fault for following too closely, according to the authors. But the same equations can be worked out to absolve the rear car in an instance where the front car did something stupid, such as cut across the rear car’s path without enough room to spare, according to Shashua and Shalev-Shwartz. 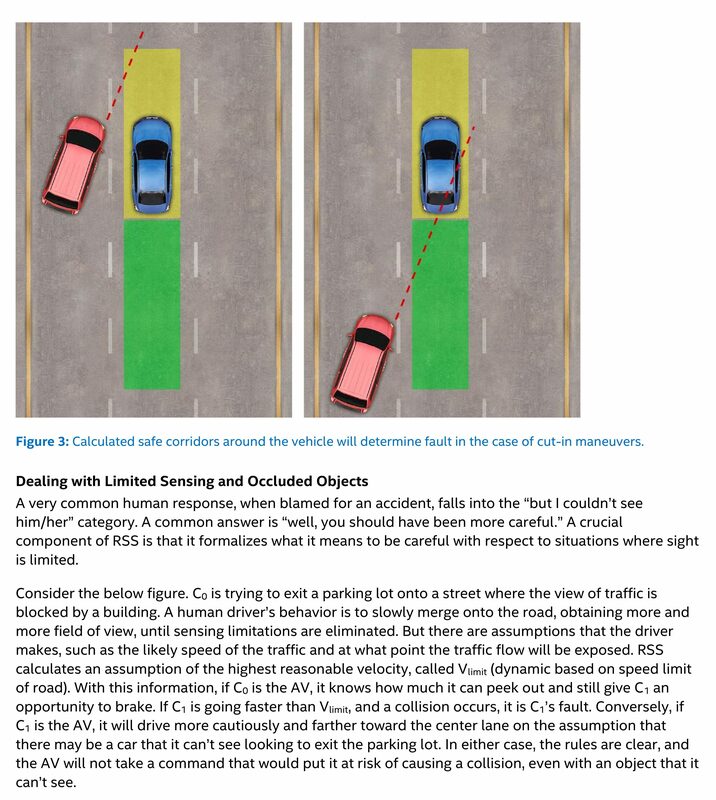 The beauty of this — unlike relying on witnesses and statements from the drivers or an adjuster or cop’s best guess — is that you actually do have answers to all the variables thanks to the AI’s vision. An AI who might have been partly blamed for a crash under a subjective investigation gets cleared. This technique is fascinating because it seems as though you could apply it using ADAS-laden vehicles today to determine fault in a human-human crash. (Granted, the ADAS would prevent some of those crashes, but some are going to be feasible.) One wonders if it also could be used to alert drivers merely to unsafe following distances.